In a recent article posted by NASA, the possibility that we may be entering a Maunder minimum type period of global cooling was openly discussed. The current very weak solar cycle 24 is supporting that hypothesis. This prompted me to take a closer look how long term solar activity has influenced commodity prices in the past. The sun is known to be in an approximately 11 year sunspot cycle, which is half of the 22 year solar magnetic cycle. This means we can filter out these 11 year and 22 year fluctuations by calculating a running 11 and 22 year average of the yearly sunspot number. Both curves are quite similar. 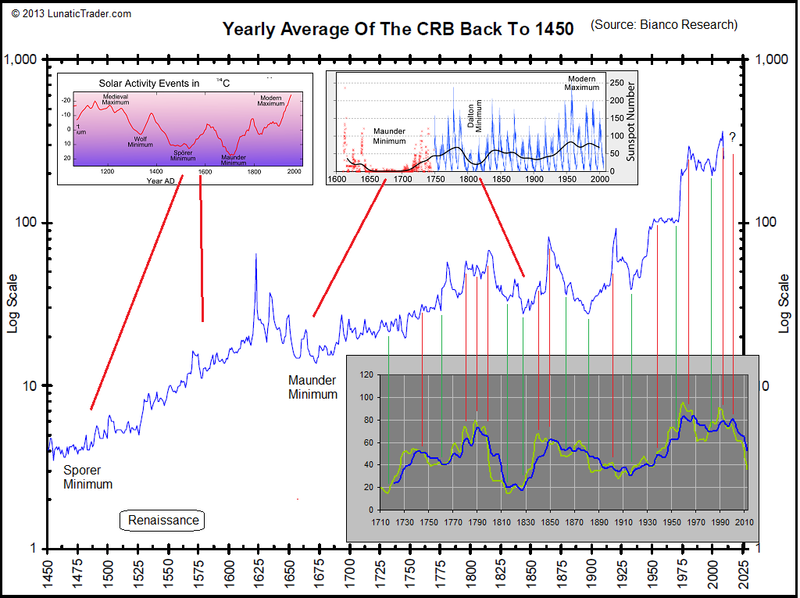 When trying to connect it to long term commodity prices I noticed that peaks and bottoms in commodities (CRB) have lagged the sunspot graph by 15 to 16 years. Or in other words: long term sunspot average has been a 15 year leading indicator for commodity prices. The blue line (22 year running average) sets the long term pattern, with the green line (11 year running average) marking some secondary peaks and bottoms. The correlation is quite remarkable. 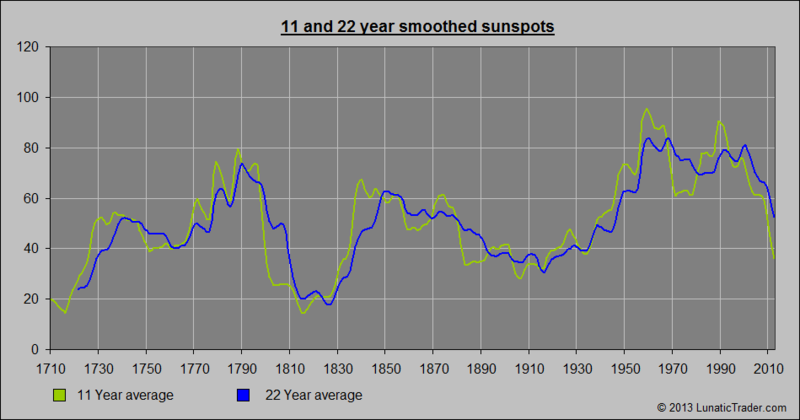 And while we don’t have yearly sunspot numbers prior to 1700, it is quite likely that the broader pattern matched sunspot averages in these earlier centuries as well. We see rather flat commodity prices coinciding with the Sporer minimum until the early 16th century, then a period of rising solar activity and rising commodity prices during the Renaissance. The Maunder minimum brought a long term downtrend in prices, which lasted until solar activity started picking up again in the 18th century. * Next major high ssn was again a double peak in 1991 and 2000 -> there was a CRB peak in 2008 and we could thus expect another one in 2015 or 2016 (15-16 year after 2000 peak). Since 2000 the 22 year ssn is falling rapidly and will probably fall to levels last seen 200 years ago. The same happened in the early 19th century (Dalton minimum), and probably also during the Maunder minimum (17th century). This is a ~200 year cycle. On these earlier occasions the CRB index dropped 70-80% within 10 to 20 years. If history repeats then a similar period of deflation would start by 2015-2016 and probably not end before 2030. If the next solar cycle is also weak then deflation could extend to 2045. A 70% decline would take the CRB down to ~140 on the basis of its 2008 peak. These earlier periods of deflation during weak solar cycles came as the result of a combination of two main factors: stagnant or declining population (because of famines and war) + technological advances that led to more efficient and thus cheaper production. That’s a scenario that could repeat itself in the coming decades. Will the central banks’ easy monetary policies prevent this from happening again? That’s not so sure. In fact their QE may well make the ensuing deflation worse, when the accumulated debts start imploding under their own weight. PS: in his newly released book, Global Crisis: War, Climate Change and Catastrophe in the Seventeenth Century , historian Geoffrey Parker describes the events of the “Little Ice Age” in over 900 pages. How would our modern society deal with such a cold period: are we better prepared, or worse? This entry was posted on April 27, 2013 at 3:36 pm	and is filed under Financial Astrology, Market Commentary. Tagged: Commodity, Dalton Minimum, Little Ice Age, Maunder minimum, solar cycle, Solar variation, Spörer Minimum. You can follow any responses to this entry through the RSS 2.0 feed. You can leave a response, or trackback from your own site. Hi, I wonder if you would like to take a look at euro? In the last 2 years it all turned down from early May. Would it be the same this year or different? Thanks. We cover the euro from time to time, either as chart of the week on Monday or trough Twitter. The 1.32 target was reached already, but there is no sell signal yet. I expect a sell signal in May. Nice work Danny…think I must have missed this article first time round, but glad I finally spotted it. Great article Danny and fits nicely with my 17.6 stock market cycle which is looking for a gold top in 2015. Thanks for putting me on you blog roll, I am getting quite a few people coming from your site. While I am always careful with long term cycles because we have only a few centuries of market observations, it is good to try and formulate hypotheses. I hope to finish a new post this week which will look in longer cycles, and it will give a possible clue where that 17.6 years may be coming from.